Here are just a few of the things we’ve seen on the starnights over the years fro m various venues. 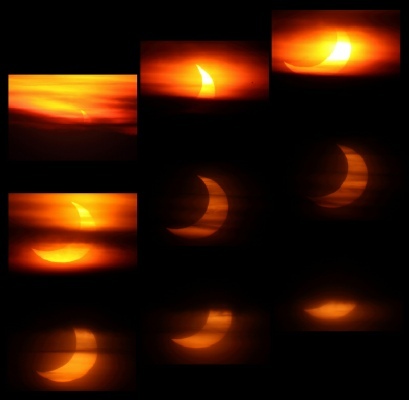 At left is the rising partially eclipsed Sun as seen from Gibraltar Point on Jan 4th 2011. 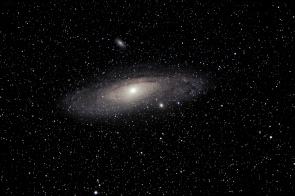 The Andromeda Galaxy is often a favourite and all the more amazing as it lies 2.5 million light years away! 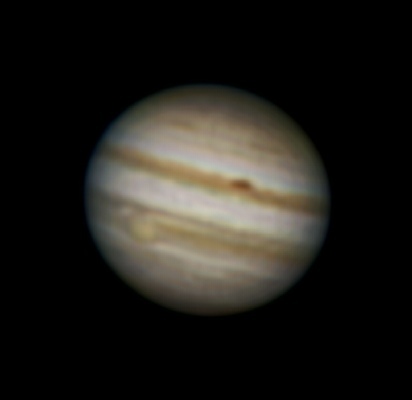 Another favourite is seeing planets such as Saturn and in the latter half of the year, Jupiter (right). Not all ‘starnights’ are actually starnights! 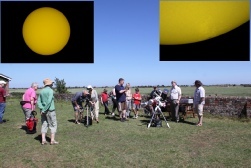 Sometimes I hold a ‘Sun Day’ and the view at left was at Gibraltar Point which was cloud free and thoroughly enjoyable with upwards of 40 attending to view the Sun safely and watch the wide range of bird life present! 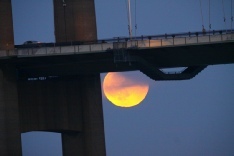 At right is the view of the rising Lunar eclipse seen from Far Ings, Barton. After a talk describing the moon and explaining eclipses we all gathered in the cold wind on the south bank of the Humber on the afternoon of Dec 10th 2011. 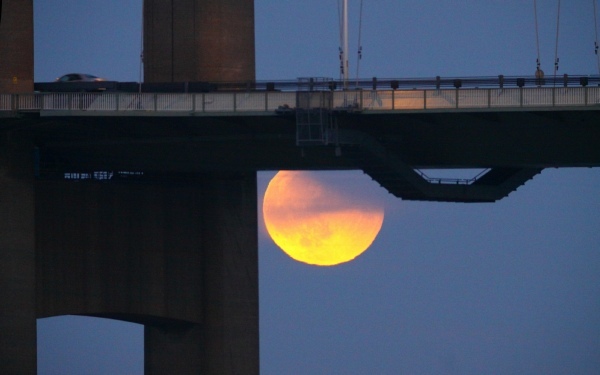 Rising up past the south tower of the Humber Bridge the partially eclipsed moon steadily rose passing through semi clear patches before becoming lost in thicker cloud. Currently none planned but hope to restart them soon. These are public events held in conjunction with a variety of organisations/venues including the Lincolnshire Wildlife Trust (LWT), Tattershall Castle with the National Trust, Chambers Farm Woods Visitors Centre near Bardney in association with the Forestry Commission and Creswell Crags on the Notts/Derby border. 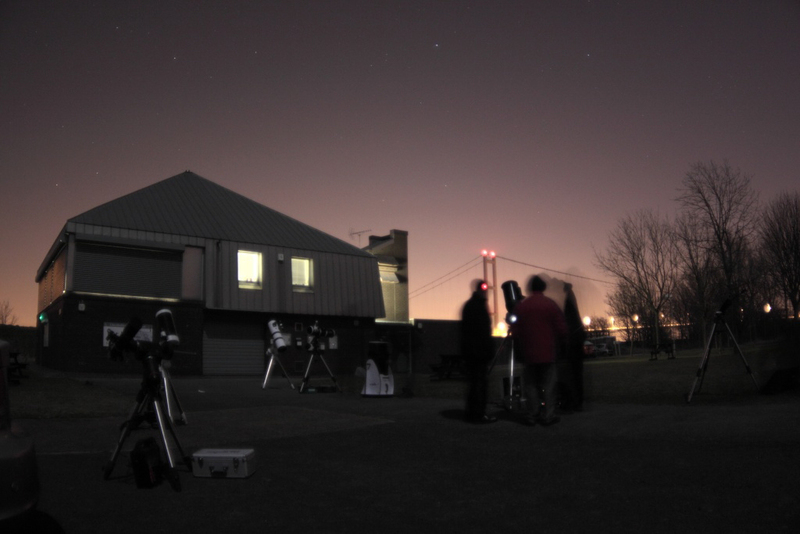 The LWT Starnights usually take place at Far Ings Visitor Centre near Barton upon Humber (right image). Creswell Crags star nights are held at the Visitors Centre at Creswell Crags, Derbyshire. Since the visitors centre at Gibraltar Point NNR has to be rebuilt there will be no star nights there until further notice. NOTE: Most events now ask that you book in advance so please refer to their respective web sites for details. All the evenings will have a basic theme but if the sky is clear then observing with my telescope and with several helpers telescopes will take place instead of (and occasionally as well as) the evening talk. 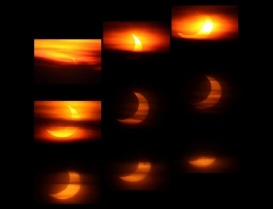 Note that the events still take place even if the sky is cloudy as I will always give a talk based on that nights theme. There will usually be a charge for admission for the public which it should be noted is beyond my control. Here’s a review done of one of the Creswell Crags Star Nights by Lynzi Pond, E-Marketing Officer, Experience Nottinghamshire. Always come prepared for observing so make sure you are well wrapped up and have good footwear especially during the winter sessions! By its very nature Astronomy and practical night sky observing are conducted in the dark so neither the Lincolnshire Wildlife Trust/Forestry Commission/North Lincolnshire County Council/Creswell Crags, National Trust nor I (Paul Money) accept responsibility for misbehaviour of participants or anyone who doesn't take care in the dark. Please bring small torches but NOT mega bright ones! Binoculars would be useful if you wish to bring them along. Children should be accompanied by adults at all times. Note that for many events the cut-off time is now 10:00pm. Many thanks to all the volunteer helpers with telescopes and to the various venues & staff for a successful year bringing the wonders of the Universe and night time natural world to the public and lets hope for clear skies for the events currently organised for 2016 and listed below.